Because I fitted my sealed units myself I already knew how to remove the glass from the frame. On my timber windows the units are externally beaded and are removed from the outside (easier said than done however so there was a bit of work needed). 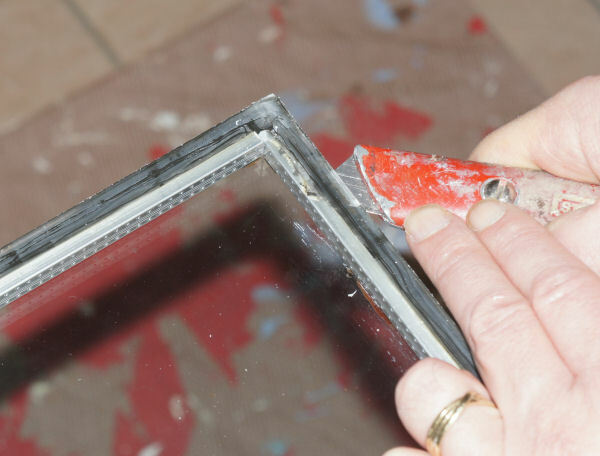 Frames can be beaded on the inside or outside - and if you wish to try this type of DIY repair you will need to find out how to remove your unit without damaging either the unit or the frame. Given the wide range of possible frame designs I can't help much with this step I'm afraid - you'll need to work this out for yourself. I also knew beforehand what the basic construction of the units was. If you can it is wise to inspect the unit whilst it is still in the frame to check the construction. Check that the spacer frame has separate plastic corner pieces that can be removed to allow the desiccant to be removed and replaced. You may wish to wear gloves when handling the glass - it depends on how sharp the glass edges are. Normally the manufacturer will have removed all the sharp edges to allow trouble-free handling, but you can't be sure so take care handling the panes. STEP 2 - Set up a good working space and support the unit. If you are working on a floor surface you don't want to mess up put down a sheet before you setup. The newly removed sealed unit will need to be supported on a solid work surface, and you will need good access all the way around the unit as you will be working along its edges. 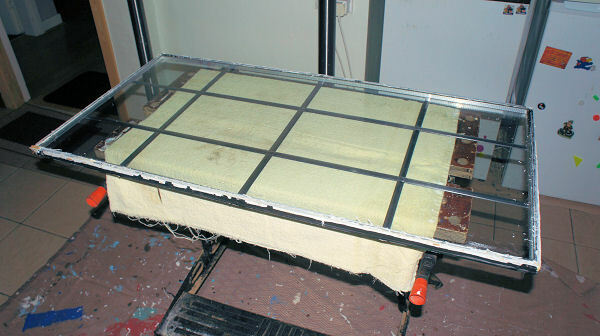 I used a workmate bench with an old towel laid on the top on which to lay the glass. This reduced the possibility of damage to the glass surface, and provided a good solid support. Helpfully the glass also overhung the edge of the support - good for handling and later when re-sealing the unit. STEP 3 - Clean-up and open-up the sealed unit. 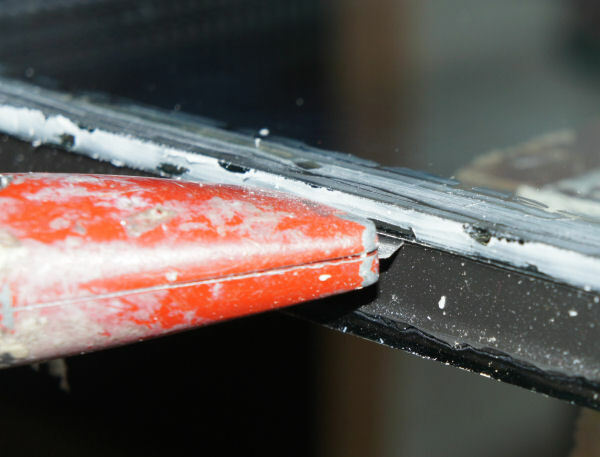 With a sharp Stanley knife (or similar) remove any sealant or putty from the top surface of the top pane. 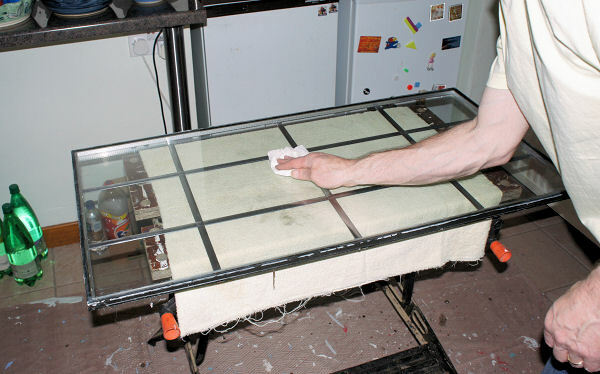 Clean the top glass surface - I found it best to clean the surface presented at each stage so that dirt was not transferred from one surface to another as the work proceeded. Then, again with a sharp Stanley knife, cut through the edge sealant against the underside of the top pane of glass. I found it best not to attempt this as one deep cut but to take a number of shallow cuts - first through the sealant and then carefully through any adhesive bonding the spacer bar to the glass. On my units the spacer was only lightly bonded to the glass - the main bond holding the unit together was the sealant to glass bond. 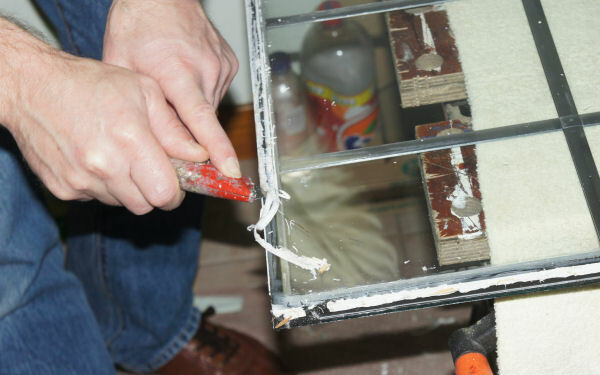 Remember you are working with glass that is brittle - don't force anything, or you'll end up breaking the pane. Remember - make sure the blade you are using is sharp. Cut along all four sides of the top pane - ie right around the sealed unit to allow the top pane of glass to be lifted off. Copyright � 2011 BFF Design Ltd All Rights Reserved.